The Swedish author Lina Wolff (1973) has lived in Spain and Italy for a number of years. 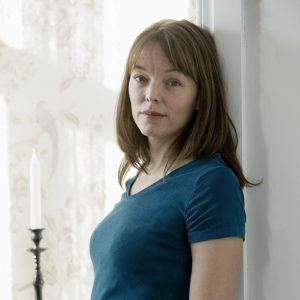 Her first book, the short story collection Många människor dör som du (‘Many People Die Like You’), was published in Swedish in 2009. Her second book, the novel Bret Easton Ellis och de andra hundarna (‘Bret Easton Ellis and the Other Dogs’) was published in English (translated by Frank Perry) in 2016 to critical acclaim. The Guardian wrote about Bret Easton Ellis and the Other Dogs: ‘Wolff’s prose has a quality of “otherness”entirely in keeping with the surreal atmosphere of the novel. This strange, provocative debut sits well alongside the work of Roxane Gay, Katherine Angel, Maggie Nelson, Zoe Pilger and Miranda July . . . a cool, clever and fierce addition to the canon of modernfeminist literature.’ In 2016, Wolff published the novel De polyglotta älskarna (‘ThePolyglot Lovers’) which was awarded the prestigious August Prize for fiction. In 2017, The Polyglot Lovers (in English translation by Saskia Vogel, due to be published by And Other Stories in May 2019) won a PEN Translates! Award. It is currently being translated to 17 languages. Lina Wolff is also a translator and has translated Roberto Bolaño to Swedish. She is currently working on a new translation of Gabriel GarciaMarquez’ One Hundred Years of Solitude. Wolff lives in Skåne in the south of Sweden.